Glacier Point is a viewpoint above Yosemite Valley, in California, United States. 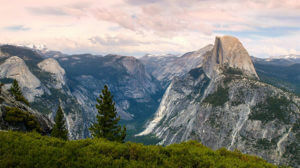 It is located on the south wall of Yosemite Valley at an elevation of 7,214 feet, 3,200 feet above Half Dome Village. Visitors stand transfixed for hours, taking in the color-saturated spectacle of sunset atop Glacier Point. Watch the sky behind Half Dome flame pink and orange while the Valley sinks into deep blue shadow. One of the best ways to explore this region is by taking the Four Mile Trail to the top or take the bus to the top of Glacier Point and take the Panorama Trail back to the valley floor. Make the trip by car or bus- or do it on foot! Car: Take the Glacier Point Road off of Highway 41, a 32-mile drive from the Valley. Hike: The adventurous can attempt the trek from the Valley. The 6400 feet of elevation change is not for the faint of heart! Plan on an 8 hour journey from the Valley via the Four-Mile Trail . See our hiking guide for more information! Bus: Round-trip and one-way bus tours service Glacier Point from the Valley.